Today, Feb. 22nd, (yep, WIP Wednesday) is my birthday. My hubby took the day off so he could spend the ENTIRE DAY with me. How lucky am I?! While it has nothing to do with polymer clay, it does me that I’m taking the day off too! This filled tile picture in the top right and lower lefts corners is just a part of the first haul to come out of my studio and need a new home. Be sure to stop by my Etsy shop and adopt some of the magic for yourself. Use the coupon code SAVE25 to save an additional 25% off your order. During my big first day of studio overhaul sales, my hubby never let my coffee cup get cold or be empty. WOW! Wasn’t that super special?! Too bad I can’t have a coffee butler every day! Thank you for your support during our Studio Overhaul & Clearance sale [read the article here]. So many of my books, clay, and miscellaneous things are going to new studios. I think it’s great! I can’t wait to show you the overhaul when it is complete. There’s lots in store coming up for KatersAcres studio!!! Grumpy faces … there’s something about a grumpy face that I just love. This grumpy face will be dolled up and added to later this week. Do you want to learn how to sculpt a face similar to this one? Maybe smiling? And learn how to make my custom faux jade too? I’m teaching a two day workshop how to do them. Want to join me? CLICK HERE to go to the FaceBook group, learn more, and get on the dibs list for the first to enroll. Seats fill up quickly! Bird’s Eye Cotton cloths for my studio … it’s a love affair. Read all about why I love them and why I use them here. You’re going to want some of these too if you’ve never had them before. COMMENT BELOW: As I’m beginning to clean out 8 years of my studio and begin the overhaul process, I’m finding all kinds of things! What are some things in your studio you could NEVER part with? Leave it in the comments below. Spread your wings and work on art other than polymer to fill your creative shoes. You never know what you might love. Here’s my “Art Notes” journal cover from all the art classes I take. It helps me to relax by taking art classes, and having my notes in a gorgeous book … it makes it that much happier! Scott Publications is closing Polymer Cafe Magazine [Read the details here] but they have opened a host of other new magazines including Just Mixed Media which includes a wide variety of polymer artists whose name & work you already know. If you haven’t already joined us, don’t forget that if you join Parker’s Clayful Tutorials Club (just $9.95 a month) anytime now through the end of February you’ll get BOTH the Toothpick Kid tutorials for the month, that’s LESS than the cost of buying both tutorials outright, a $19.95 savings! It’s week 8 of the #2017PCChallenge and it’s not too late to join the fun. Come on over and join the 2017 Polymer Clay Challenge. Don’t forget: Debbie Crothers new, highly anticipated Swellegant veneer tutorials are available now and are discounted through the end of February. 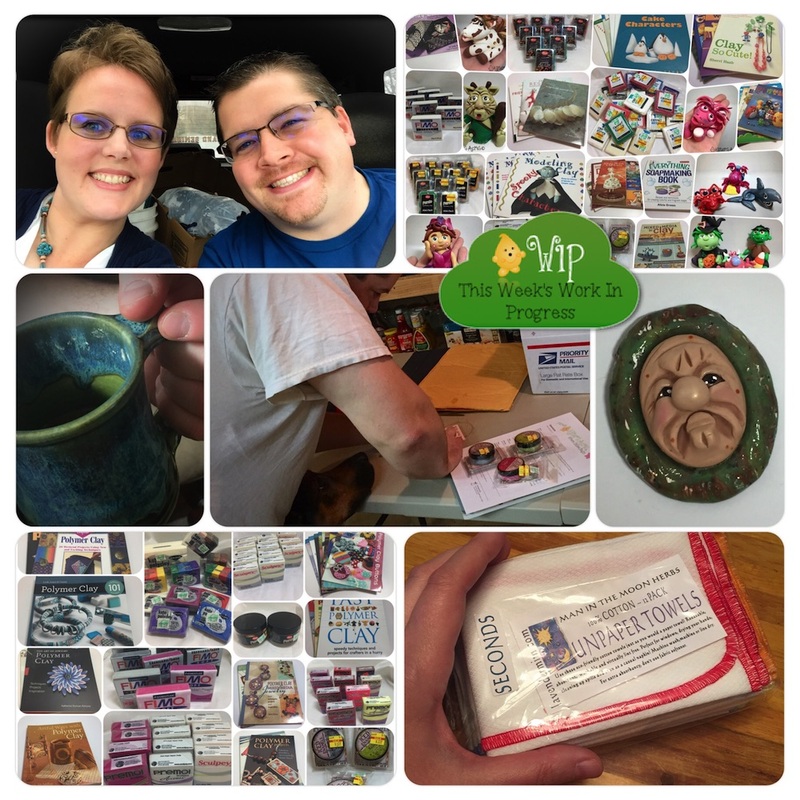 Need inspiration, encouragement, and a place to share your polymer clay work? Don’t forget to come and join us over at Parker’s Clay Tribe, a FREE FaceBook group. Sara Spanu’s giant shell made completely out of polymer clay? Find it in the IPCA FB group. Thomas Gibson is hard at work making bottles of hope and using them for his #2017PCChallenge. His newest Dragons Horde glows in the dark and is really fantastic. Find it in Parker’s Clay Tribe. Georg Dinkel’s newest figurine, morning walk? Find it in the IPCA FB group. Oh the faces of fantasy and winsome. Shirley’s Studio has this terrific fancy troll that’s sure to make you smile. Find this on Instagram. I just love Alice Stroppel’s colorful birds. Find them on Flickr. Sometime I choose artists whose work has caught my eye during the week and share their work here during WIP Wednesday and on my FaceBook page, KatersAcres. How do you catch my eye? It’s simple … use social media. Here’s a few easy ways to catch my attention: become part of FaceBook groups, showcase your work on your FaceBook page, Twitter, Instagram, Flickr, Pinterest, or even tag me @KatersAcres in your photos on FaceBook. Don’t Be Silent; Chime In! Do you have a WIP Wednesday to share? Is there a project you’re working on? Let me know in the comments below. Previous post: The Year of Discovery’s Studio Clearance Sale!